Louann is using Smore newsletters to spread the word online. Skills that make a good store manager. Being in a sales assistant position, you're there to assist customers and make sure their shopping experience is enjoyable so they come back. A sales assistant helps create repeat business which in turn generates money for the business. You'll report to your manager or supervisor. You will also need to have basic maths skills. How much do you get??? Well it depends where you work and could also depend on your experience for instance if i work in a Lush that is located in more of a rural area i would get £7.20 opposed to if i worked at a Lush in central London i would get £9.30. And also the same with managers. Full-time salaries can be between £11,000 and £15,000 a year.Many larger retail companies also offer benefits like staff discounts, extra pay depending on how much you sell (known as commission) and bonus schemes. Salaries are between £20,000 and £30,000 a year. With experience, earnings for larger store managers can rise to over £40,000 a year, possibly reaching £70,000. You may also earn extra bonuses and commission for meeting sales targets. While we're at it ............. lets compare hours. In a full-time job they would normally work between 37 and 40 hours a week. Part-time work is often available. Their hours are likely to include weekends and possibly evenings, depending on the store's opening times. They would divide your time between the sales area and your office in the store. In a full-time job you would normally work between 35 and 40 hours a week, possibly including weekends and evenings. Part-time work is often available and you may work shifts. You would spend a lot of time on your feet and may need to lift and carry items of stock. You would often wear a uniform. What qualifications do I need??? Promotion within a company is a common entry route, By building up your experience as a retail sales assistant and through training and development, you could move up to sales supervisor then departmental manager jobs. Good customer care skills are essential and when applying for jobs, it will be helpful if you already have some experience of working with the public. Good literacy and numeracy skills will also be useful, for example for when handling cash. 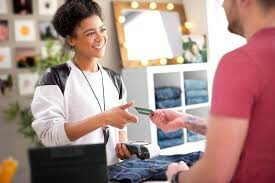 Many stores employ temporary staff at busy times such as Christmas, and this can be a good way of getting experience that can lead to a permanent job. You may also be able to start this career through an Apprenticeship scheme. You will need to check which schemes run in your local area.